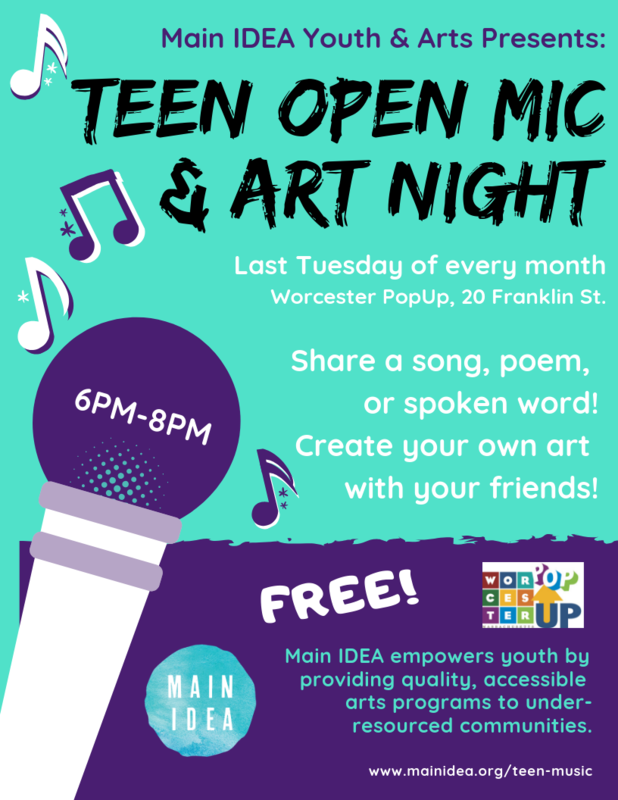 Main IDEA Youth & Arts is excited to be hosting another Teen Open Mic & Art Night event at the Worcester PopUp! These events are FREE, occur monthly, and are open to all teens ages 13-17. Come by to share a song or spoken word, sketch or paint your own work of art, and enjoy free refreshments! Parents/guardians and friends/family are welcome to stay to watch the performances; parents/guardians dropping off must sign their teen in/out in order for their child to participate. Disclaimer: The Worcester PopUp is a creative co-working space of the Worcester Cultural Coalition in partnership with The Barr Foundation. This event is not sponsored by, nor does it necessarily reflect the views of the Worcester Cultural Coalition.